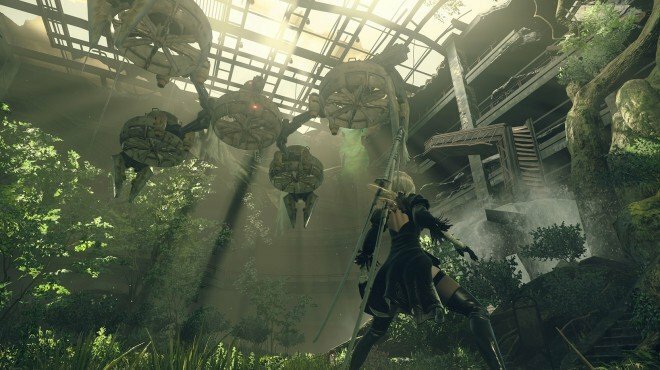 Obtain Keys is a Main Story Quest in NieR: Automata. "The mysterious tower in City Ruins cannot be hacked, but obtaining the recovery units may change this." Shut down the "God Box"
After completing Tower Recon, 9S will be sent to the Forest Zone to obtain keys for access to the tower. Approach the large recovery unit, and it will enter self-defense mode. Go the the entrance and your pod will inform you the language is "Angelic" and it reads "Meat box"
Press circle on the nearby machine to end this quest. You will be able to select to play as 9S or A2 next. 9S continues this quest, sending you to the Flooded City The recovery unit here reads "Soul Box". On the second floor, you will gain several +6 Chips alongside the weapon Faith. Once you are done with the repairs, go to the Amusement Park. This recovery unit is called "God Box"
Go into the first room and open the chest in the middle, it will turn dark and several enemies will attack you. Use hacking to destroy them quickly. In the next floor, seeral ranged machines an a linked-sphere type attack you. Hold down Square to charge ranged attacks for the machines, and defeat the link-sphere by using a charged pod laser. Following, you will by attacked by flyers and Medium Flyers. Next up there will be a boss fight agains Operator 210. Fight her and a cutscene will follow between 9S and A2. A boss fight between A2 and unit Auguste triggers next. When you defeat it, many machines will turn up and beg you not to continue destroying him. Walk forward to trigger a cutscene and the trophy "Justice"
After a cutscene, you will receive Park Access Key x1, and the quest Tower Infiltration.